A chance to submit an eye-catching work of art is on offer as a church seeks a new look for its grounds. 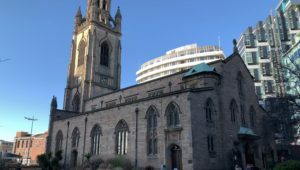 Liverpool Parish Church, also known as Our Lady & St Nicholas, has launched its annual competition looking for the latest ‘Liverpool Plinth’ sculpture. The platform, located at the side of the church on Chapel Street, has been home to ‘Gold Lamé’ for the last seven months. The striking centrepiece, produced by disabled sculptor and artist Tony Heaton, is based on the famous Invacar – a small, blue, one-seater vehicle given to disabled people during the 1960s and 1970. It looks to challenge the perceptions of disability in society. Now, as part of the yearly rotation, the parish is looking for artists across the region to suggest existing artworks to replace the ‘Gold Lamé’, which will be returned to Mr Heaton. Unused until 2017, the plinth has now become a regular focal point. Revd Butler-Gallie told JMU Journalism: “The role of the plinth is important as it’s a clear sign that both the church and Liverpool itself are hubs for exciting new projects and creative ideas. The competition is open to artists from across the north of England, with the deadline for entries being March 28th 2019. Entries can be submitted via email to gallery@dot-art.com or by calling 0345 017 660. Suggestions must be ready in time for a late springtime installation date.